More than a landmark, the Lafayette Hotel is a survivor with class. The Marietta hotel, gateway to Front Street with a commanding view of the waters on which the first settlers sought a landing where the Muskingum flows into the Ohio, will mark 100 years since its opening on July 1. Built on the ruins of the Bellevue Hotel, which was destroyed by fire in 1916, the Lafayette has endured floods – the worst in 1937, when the high water mark hit more than 10 feet above the lobby floor, and the most recent in February of this year, when water filled the basement but missed intruding on the main floor by a small margin – dried out and come back for more. For its centennial, the hotel has a grand evening planned June 29 in the grand ballroom, said sales and marketing director Christina Thrasher. It will be a chance to show off the work done in the ballroom, she said. Since January the hotel has refinished the floor and ceiling, replaced the chandeliers and installed a new sound system. Photos courtesy of Special Collections, Legacy Library, Marietta College The front of the Lafayette Hotel is shown here as it appeared in the late 1950s. The ball will have a Roaring Twenties theme, an idea that was a hit with Marietta folks at the most recent murder mystery event, Thrasher said. From 7 to 11 p.m. on that Friday night, the ballroom will serve “heavy appetizers” and desserts and offer a cash bar and live music by the Hipsters, she said. The music will fit the 1920s theme, acoustic, bluesy and jazzy. Tickets are $45 or $80 per couple, and 250 will be sold. Other centennial developments for the hotel include the opening of Marietta’s first Starbuck’s which is being installed off the lobby where the hotel’s gift shop used to be. Thrasher said it should be open by July 1. The hotel has a history of doing things as time goes along. Originally built in 1918 after the catastrophic fire that ruined the Bellevue and bought in 1921 by Reno Hoag, the hotel added several rooms as time went along, acquiring adjacent buildings for expansion space and parking. 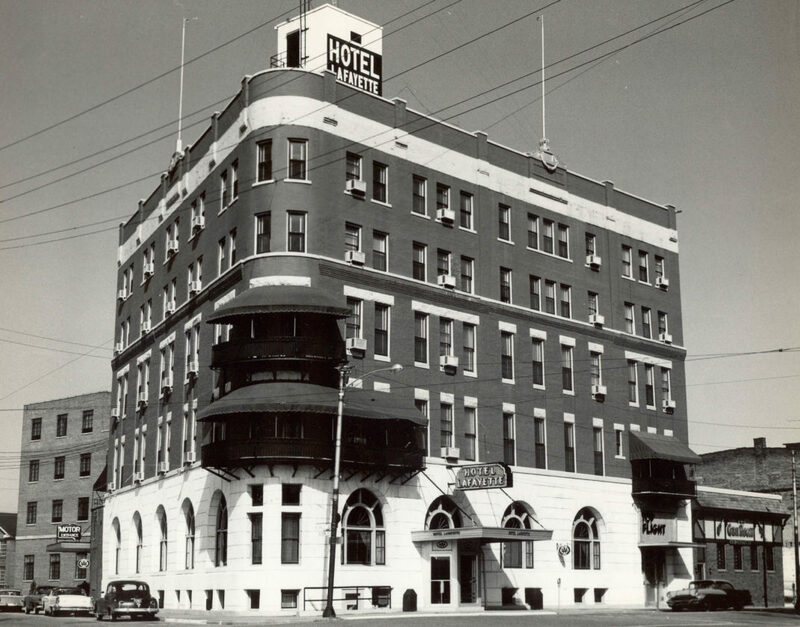 S. Durward Hoag, who was 17 when his father began managing the hotel, formed a partnership with his dad to buy its contents and lease the building. They bought it outright in 1931, and S. Durward Hoag through the succeeding decades became the public face of the hotel, dedicating time and energy to its development and to causes in Marietta, even living in one of the rooms for much of his life. Hoag was a tireless promoter of the hotel and Marietta. In a 1950s edition of Hotel Monthly, the magazine described him as a “one-man chamber of commerce,” and he wrote a column in the Times during that period three times a week. He once described the Lafayette as “one of the nation’s first back-door hotels,” a reference to the rear entrance where guests could have their luggage unloaded before checking in. Hoag sold the hotel to Bel-Par Realty in 1973, and 10 years later it was sold to two Marietta businessmen. 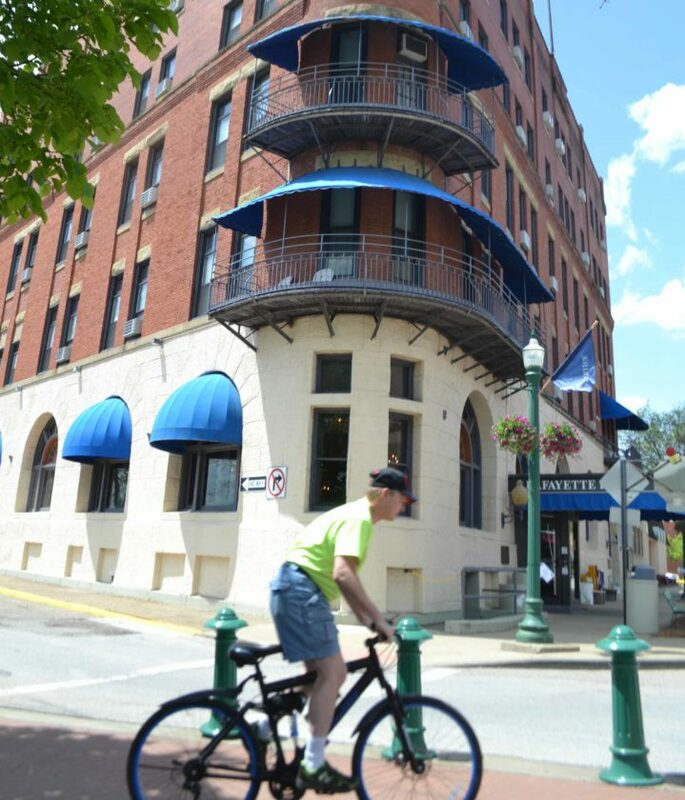 It changed hands again in 1991, when the current owner, Lafayette Hotel Inc., purchased it. Hoag died in 1982, and his ghost is said to be seen occasionally on the second floor and in the Gun Room restaurant. Harley Noland, who has a background in architecture and is a former city council member, said the hotel at one time was the social center of Marietta, where all the clubs met, where birthdays and anniversaries were celebrated and where the alumni from Marietta College stayed. “It was the place to have a wedding reception,” he said. It still is host to receptions, as well as other events and is known for booking rooms years in advance for the Ohio River Sternwheel Festival weekend due to the proximity to the festival and view of the fireworks. The architectural style, Noland said, is a mixture because of additions and rebuilding over the decades. Noland once worked at the hotel. ≤ What: An evening themed on the Roaring Twenties. ≤ When: 7 to 11 p.m. June 29. ≤ Where: Lafayette Hotel grand ballroom.